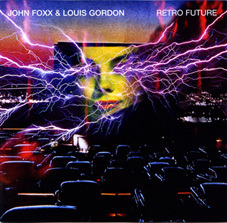 Retro Future is a live album, recorded on the Exotour, on 10th January 1998 at Shrewsbury Music Hall. It was released for John Foxx’s 2007 Metamatic tour, and originally limited to 1000 pressings. Despite what the title suggests, Retro Future is far from retro – it is a marvellous, fresh-sounding recording, full of energy. It perfectly encapsulates an electrifying atmosphere, on what was a landmark tour in Foxx’s career. Right from his optimistic “Hello everybody”, it’s clear that the quiet man had returned. The excitement captured on Retro Future is second to none. Many fans (including a certain Gary Numan) had waited years to hear tracks from Systems of Romance and Metamatic played live, and for those people this tour was a dream come true. The live arrangements are taken from the Omnidelic Exotour recordings, which was originally on sale at the shows. These live rentidions of the Exotour tracks really come to life, bringing a whole new perspective to them, most of them being significantly improved. This recording does omit three tracks from the original show, which were present on a bootlegged version; “The Noise”, “Through My Sleeping” and the encore, “Endlessly”. But even so, Retro Future works really well as a live album, showcasing some of Foxx’s best songs. Retro Future is a real gem from the archives, documenting John Foxx’s return to the music scene in 1997 and first tour since 1983. Despite its subtle release a decade after it was originally recorded, Retro Future stands out as one of John Foxx’s most important recordings to date.